Word on the street is that professional organizations are dying. One would think that in this unstable economic time, professional organizations would be thriving. Not only do they provide a common place to meet other professionals with similar interests, they also provide connections to career opportunities. One of the major concerns is that they are becoming irrelevant, especially when there are many organizations doing ostensibly the same thing. This concern resulted in several professional organizations reinventing themselves to focus on their "brand." But many individuals are no longer able to justify the cost of being part of an organization in the absence of tangible benefits. Sometimes advantages made through professional organizations are direct (career listings, resumé boards, mentoring); other times, benefits are more subtle. Many professional organizations provide professional development through certifications and continuing education programs. Beyond opportunities for career connections and professional development, these organizations also provide camaraderie in the form of a friendly environment to test ideas. Although you may not want to take your work home with you, there are few times when a GIS professional can sit down with someone who has the same base level of knowledge. Many of these organizations are also the first place to learn of new technologies and trends within the industry. They help disseminate information by publishing journals and newsletters highlighting the innovative use of technology by their members. Professional organizations are vital to the life of the profession itself. Many professional organizations take the lead in developing industry standards. For example, the Urban and Regional Information Systems Association (URISA) authored and maintains The United States Thoroughfare, Landmark and Postal Address Data Standard, and the American Society for Photogrammetry and Remote Sensing (ASPRS) standards committee has authored Accuracy Standards for Large-Scale Maps, LAS specifications (Version 1.4-R12), and Vertical accuracy reporting for LiDAR (Version 1.0). If industry experts do not take the initiative to develop and set standards, who will? These organizations also provide a unified voice for their members by advocating for issues within the industry. No one ever wants to be in a position where they have to use a safety net, but it is comforting to know one is there. Building connections within a professional organization allows people to become familiar with your work ethic. In return, your list of potential references should continue to grow. Organizations are all looking for contributors who do more than pad resumés. Do your research. 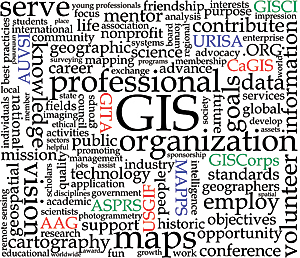 Are there professional organizations that are tailored to your interests within the GIS industry? Spatial professionals are needed in what may seem obscure places, such as the Association for Unmanned Vehicle Systems International. Maybe some organizations fit your personality more than others. When you research the different opportunities, you are going to feel as if you are in the land of alphabet soup with all the different acronyms. Be patient, though, and look at each organization's mission statement to see if it is going to advocate for your concerns. Start local. It helps to be able to get to know people face-to-face. And, it is possible to get a good idea of the "mother" organization through the local groups. However, this is not always the case. If there are no local professional organizations in your area, consider working with colleagues to champion a local chapter or organization. Check for reduced membership rates. Many organizations are also offering student or young professional discounted rates. You can also check to see if your school or employer may already have a membership or sponsorship, as you may be able to become a member through your organization without paying a dime! Go to a conference. Conferences are a great place to meet people with similar interests. It is common for user groups to have a meeting during a conference. Many conferences have mentoring opportunities, physical resumé boards for employers who are looking to hire, or employer meet and greets. Giving a presentation may help your current employer justify sending you to the conference, and it will definitely help build your credibility within the profession. It is also another opportunity to gain valuable critiques from your peers. Become involved. Are you currently a member of a professional organization or looking to get more involved? Scour their websites for working groups and initiatives; organizations are always looking for free labor since essentially none of the professional organization positions are funded. If you volunteer and do what you say you are going to do, providing a quality "product" in a timely manner, more opportunities will become available. Consider sitting on the conference planning committee (once you've attended one, of course). Most of the time, professional organizations will put out a call for participants in their initiatives. These calls will often be on their website or monthly newsletter. If you can't find something that fits, try to contact an active member in the organization. How do you find them? Their name will be on the website! People who are passionate about their professional organizations will be more than happy to talk to you and may also be able to help find a place for you because they may know about initiatives that are just beginning. Do not overcommit yourself. Most organizations will let you sit in on conference calls or group meetings at conferences to see if they fit you. Have a goal in mind of how much time you are willing to spend with the organization. Know your limits. Once word gets out that you are not only willing to volunteer but you also provide quality input, others will come knocking on your door. But that knocking will stop if you don't show up and deliver what you promised! To help restate one of the points of this article, this very article itself only came about because we met through URISA: yet another example of the camaraderie that comes about from participating in professional organizations! Many good things can come from professional organizations, but in order to continue to be relevant, they need volunteers who are passionate and not just there to advance their personal agenda, or professional organizations really will become extinct. Professional organizations are realizing that networking is not the only selling point to retain and attract new members. Now is the time to become involved and help shape the professional organizations into something that is truly for the profession! Ryan E. Bowe, GISP, has been working at Photo Science, a Quantum Spatial Company, for eight years as a GIS technician, as well as an alternate sensor operator. She was recently recognized as URISA's Young Professional of the Year for 2013. Wendy Peloquin, GISP, is a GIS analyst at RS&H in Jacksonville, Florida. She serves as a member of URISA's Vanguard Cabinet, Georgia URISA's Event and Conference chair, and Florida URISA's northeast regional director. For more information, contact Ms. Ryan E. Bowe, GISP.